Chick Evans introduces our new Assistant General Manager - Mel Santillan! I'd like to introduce Mel Santillan this season as our newest member of the group. Mel is taking on the role as our new assistant general manager. Mel is married to his beautiful wife Lesli, and they've been together 18 years and married 14 years. He has twin children....Payton (Daughter) and Calvin (Son) who are 6 years old this year. Mel has a vast background in the restaurant business and retail business. 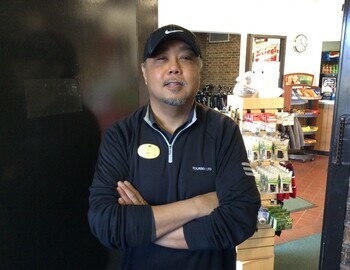 He's had management experience at Golf Smith, and started as a clerk at our sister course Indian Boundary. Mel is an avid golfer and plays hockey during the winter season. We're happy to have Mel join the team. If you see Mel....just make sure you give him a firm hand shake and welcome him to Chick Evans.